Free delivery on everything ! Many styles Brands and Options On Promotion. USE CODE BFXTEN for 10% off Cyber pricing PLUS TCB QC Cashback! Penny Loafers also for the WIFE Barbour bargain. I have a pair of Barbour green willies which are well over 20 years old! Still wearable but are badly faded. I wonder if these new versions would be of the same quality? I know Hunters are not the same quality as they once were! Have just ordered a green pair while size 8 is still in stock. Total price was £43.87, seems a good deal! How did you get free delivery? Seems to be over £60 to get that? Modern Hunters are fashion rubbish made in China these days (nothing like they used to be). Don't know about Barbour though. I bought the Farsley Chelsea boots. Same as you frustrates me not getting good quality. Barbour only cost me £43 with free postage so saved at least £40 over the hunters so I'm happy. Very good price, paid £65 for these earlier in the year! Copped some Olive/Greens for £43 free postage, that's a great price nice one! Just ordered a pair for the OH. 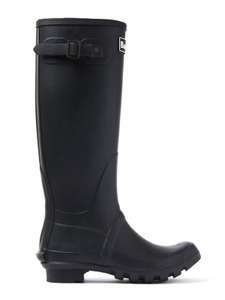 Great deal for Barbour wellies. Thanks FlahertyDeals, I ordered a pair of Barbour wellies. They should serve well with tending the horses. I particularly like the north-east link of Barbour (their styles are named after north-eastern towns). Heat for the "Simply simply lovely" comment - bloody marvelous sir! Shame the Men's wellies are more pricier! If you're buying wellies to use as wellies (you know, in the mud, snow, etc., not to flash at the horse trials) you'd be better off with a £10 pair from Sports Direct - really! Hunters really are rubbish . I walk the dog in usually muddy fields twice a day . My wellies get 16 hours use a week and I’ve reverted to Dunlop’s with good removable insoles . Hunters on average last two months before they split and leak. Dunlop’s about 7-8 months. If you're buying wellies to use as wellies (you know, in the mud, snow, …If you're buying wellies to use as wellies (you know, in the mud, snow, etc., not to flash at the horse trials) you'd be better off with a £10 pair from Sports Direct - really! So are the Barbour ones not very durable? My only experience with wellies so far is the Joules ones which broke after one wear walking the dog - their ones are def just made for women who want to stand in a puddle with nice looking wellies on, not for actual dog walking I need a good pair of wellies! Hunters really are rubbish . I walk the dog in usually muddy fields twice …Hunters really are rubbish . I walk the dog in usually muddy fields twice a day . My wellies get 16 hours use a week and I’ve reverted to Dunlop’s with good removable insoles . Hunters on average last two months before they split and leak. Dunlop’s about 7-8 months. Two months!? That's terrible! I need dog-walking enduring ones, sounds like Dunlop it is then! Two months!? That's terrible! I need dog-walking enduring ones, sounds …Two months!? That's terrible! I need dog-walking enduring ones, sounds like Dunlop it is then! Any that don't fall apart, couldn't care less what they look like or what I look like when walking the dog! The Joules ones the water just sleeps through the seems - they're total crap! So are the Barbour ones not very durable? My only experience with wellies …So are the Barbour ones not very durable? My only experience with wellies so far is the Joules ones which broke after one wear walking the dog - their ones are def just made for women who want to stand in a puddle with nice looking wellies on, not for actual dog walking I need a good pair of wellies! I can't confirm on the Barbour ones (though I'm suspicious) but the consensus is that Hunters are rubbish these days. What is true is that (subject to fit of course) 'real' wellies are only about £10, but they won't get you points at the pony club! ..... and plenty in the tank! I can't confirm on the Barbour ones (though I'm suspicious) but the …I can't confirm on the Barbour ones (though I'm suspicious) but the consensus is that Hunters are rubbish these days. What is true is that (subject to fit of course) 'real' wellies are only about £10, but they won't get you points at the pony club!